Our stone fabrication services are only limited by your imagination and budget — if you can dream it, we can build it. 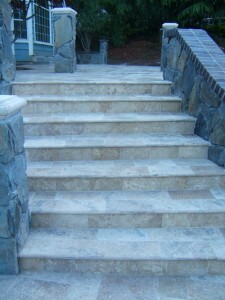 We offer people in the Monterey Bay and Salinas Valley professional fabrication services for building custom countertops, stone floors, grand marble staircases and framed hot tubs. Our skilled team has years of experience in transforming granite, marble, quartz, limestone and other types of stone into practical and spectacular designs. Our deep understanding of natural stone results in superior craftsmanship, efficient work processes and end-to-end service from design to installation. Call or contact us today for answers to your questions about stone fabrications, designs, properties of various types of stone and surfacing and finishing strategies. We ensure that each of your stone projects is competitively priced, skillfully executed, efficiently installed and durable and versatile enough to provide a lifetime of natural elegance and increased home value.